From the moment you step into this beautiful spacious bed and breakfast suite, you feel the warmth and romance of this very unique place. 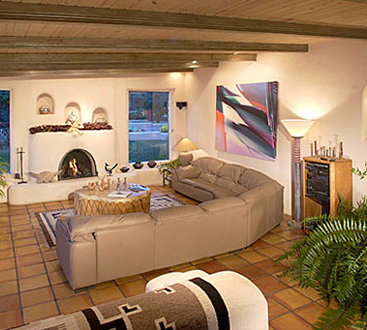 The suite is appointed with wonderful local art, paintings by James Mac, a sculptured cactus coffee table, and an adobe fireplace, made by well-known artist Carmen Velarde. A large leather sofa invites you to enjoy a warm pinion fire. Picture windows throughout the suite allow you to enjoy the lovely patio garden and uninterrupted views of the surrounding landscape and mesa like no other Taos lodging. The graceful arched doorway frames the bedroom area, complete with an inviting down comforter on a king bed. An eight-foot hand-carved vanity and private bath add the finishing touches to this romantic space. 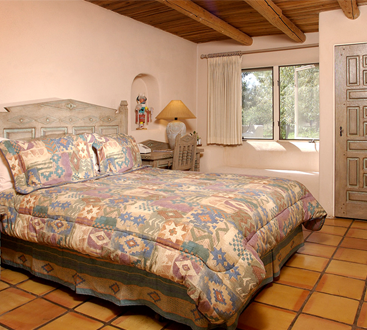 From the bedroom area step out through the French doors onto the portal, wander around an old orchard that dates back to the original hacienda and take in our spectacular New Mexico sunsets. 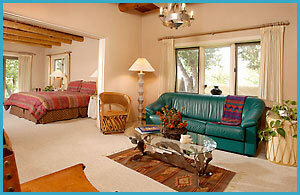 Accommodations include telephone and television. 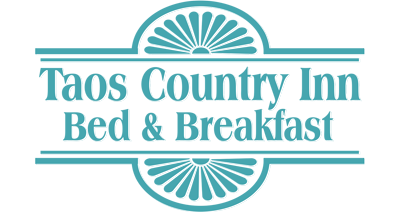 If you’ve decided that this bed & breakfast room is right for you, please click here to request a reservation.